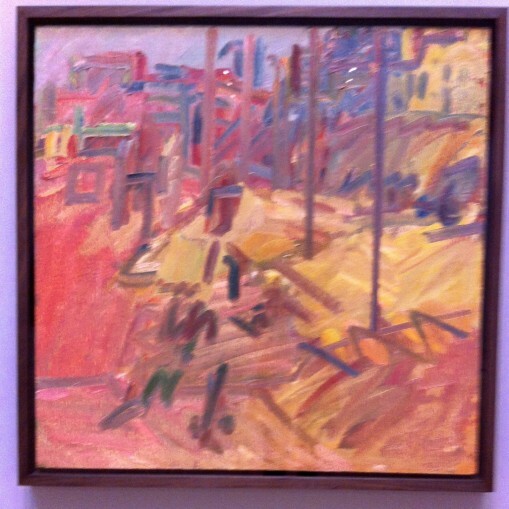 Of my recent three visits to London where I saw Peter Lanyon, Ai Weiwei, Rothko, Leotard and several old favourites at The Courtauld and The Tates; the favourite was the Auerbach exhibition. Taxing on the brain but ultimately so rewarding. Curating is paramount and this was no exception. Lambert’s contribution was excellent especially in the last room where she had left the fireworks till last. Colour popping off every canvas. 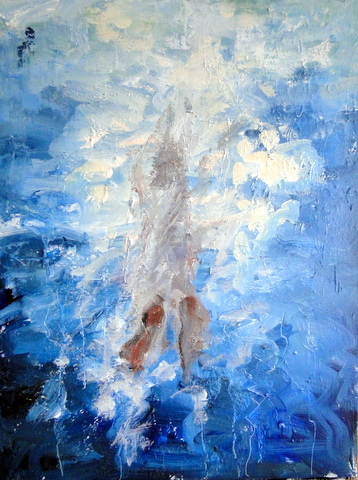 Auerbach endlessly scrapes back and reworks the paint leaving a tangible presence of the artist. His quiet, domestic subject matter – view of the studio, view of Primrose Hill through a doorway; become visions of high drama and such unexpected beauty with his vigorous deft movements of brush and paint. I captured one image very badly, on my phone. I abhor the new permission to allow photography. No photograph can come close to standing within touching distance of a painting where you can breathe in every brushstroke and nuance, but I succumbed to temptation just so that I could remind myself of the moment of being there.